Accepta 3552 is a high performance; technically advanced marine diesel fuel oil conditioner and stabiliser. It is a scientifically formulated marine diesel additive made using a blend of biocides, dispersants and anti-oxidants all carried in aromatic naphtha. Accepta 3552 is a highly efficient fuel oil treatment that comprises a complete and balanced marine diesel additive with an array of performance benefits, providing valuable operating assurance and reliability. 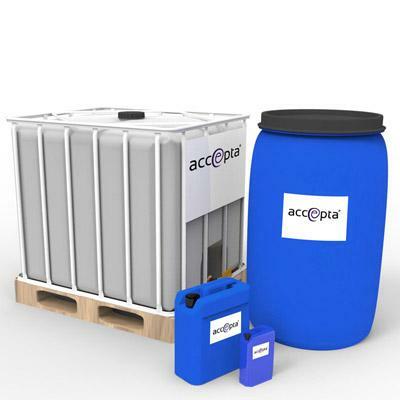 Accepta 3552 is designed specifically as a marine diesel additive and will help to control bacteria and prevent the formation of organic sludge. It also discourages injector sticking, prevents filter blockages and will facilitate the blending of high and lower grade fuels. Additionally, Accepta 3552 helps to limit corrosion in bunkers, tanks and lines. For best results, Accepta 3552 should be added to fuel oil whilst filling, since complete dispersion is readily achieved by this means. It is also acceptable to team fuel oil onto a heel of Accepta 3552 added firstly to the tank. Generally to maintain premium grade fuels addition loading of 5-30 ppm will suffice. To recondition poorer fuels where sludge and bacteria/fungus are already present, application rates of 40-80 ppm are advised. Application rates vary in response to fuel grade and quality. For further technical assistance concerning Accepta 3552 please contact Accepta.